Revolutionary Mural To Return To L.A. After 80 Years In 1932, Mexican muralist David Alfaro Siqueiros visited Los Angeles and painted a mural that proved so incendiary, it was almost immediately censored. Eighty years later, that piece -- America Tropical -- will finally come back to life. A Modern Look At A Modernist Past: David Alfaro Siqueiros' America Tropical, shown here in detail, is being brought back to life through conservation and a display that will project a digital rendering of the mural -- much like this -- over the faint original. Enlarge to view the entire work. Nearly 80 years after Mexican muralist David Alfaro Siqueiros left Los Angeles, he is once again creating a buzz in the city. In 1932, a mural Siqueiros was commissioned to paint turned out to be a controversial piece of art that was quickly censored. For decades, Chicano artists and activists have worked to bring the mural back to life -- and that mission will soon be accomplished. 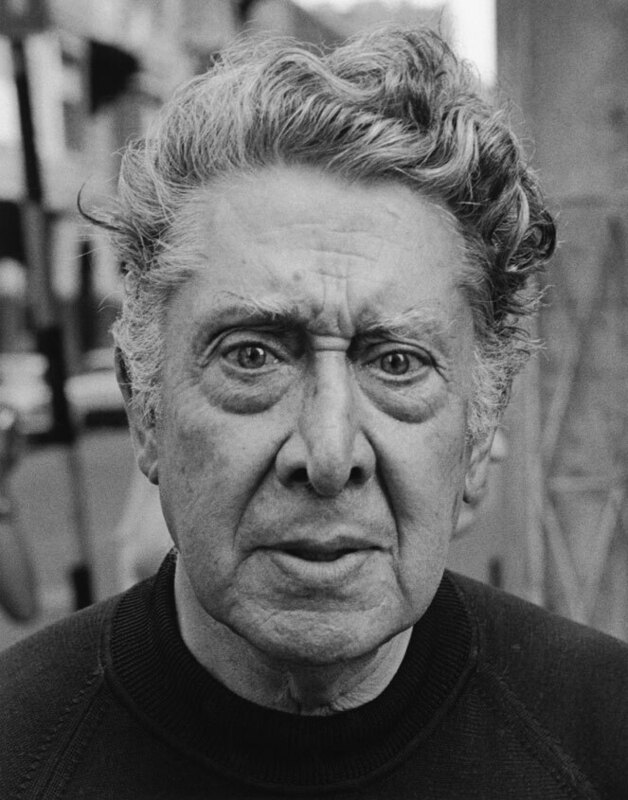 Painter David Alfaro Siqueiros helped establish the Mexican mural movement of the 1930s. Early last century, Siqueiros, Diego Rivera and Jose Orozco were the three major politically active Mexican muralists who merged revolutionary ideas with public street art. But Siqueiros' prominence in Mexico didn't do much to keep him out of trouble. In 1932, the artist was jailed for his radical militancy. After his release, he secured a six-month visa to L.A.
"Siqueiros -- being the idealist that he is and having fought in the Mexican Revolution -- well, in Los Angeles, he fuses art and politics," says Luis Garza, curator of the current exhibition of Siqueiros' work at L.A.'s Autry Museum of the American West. The show features depictions of three murals Siqueiros painted when he lived in L.A., including one he painted on historic Olvera Street. Writer Ruben Martinez says Olvera Street was meant to be an idealized version of a Mexican marketplace: "quaint, folkloric, cutesy, touristy and assiduously avoiding anything controversial or political." He says his grandparents used to play guitar and sing at La Golondrina Cafe on Olvera Street. While they were working downstairs, Siqueiros was upstairs on the roof, painting the mural. "My grandparents were part of staging the quaint folkloric Mexico," Martinez says of La Golondrina. "And Siqueiros was painting something that flew in the face of that. It was a great subversive act." In making the massive mural on the wall of the old Italian Hall next-door to La Golondrina, Siqueiros pioneered an experimental technique of spraypainting, inspiring many graffiti artists who followed. 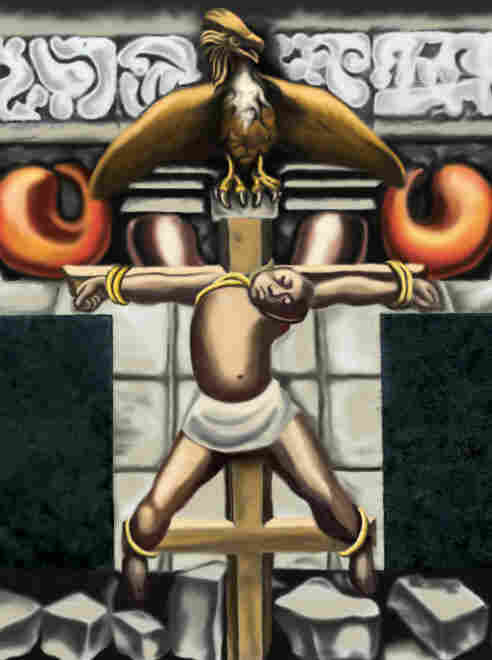 The center of Siqueiros' mural depicts an indigenous Mexican peasant lashed to a double cross beneath a symbol of American imperialism -- the American eagle. Martinez says besides being a "quaint ethnic theme park," Olvera Street also was a radical political venue for gatherings of labor organizers, and Italian and Mexican anarchists. In a 1971 documentary by Chicano filmmaker Jesus Trevino, Siqueiros explains that he'd been commissioned to paint a lush, romanticized, idyllic mural with the theme of "Tropical America." "But for me," Siqueiros says in the documentary, " 'America Tropical' was a land of natives, of Indians, Creoles, of African-American men, all of them invariably persecuted and harassed by their respective governments." At the time of the mural's commission, Mexican immigrants and Mexican-Americans throughout the Southwest were being rounded up, packed into railroad cars and deported to Mexico. Police "Red Squads" were violently breaking up union meetings, and racially motivated trials were sending African-American men to prison for life on hearsay evidence. 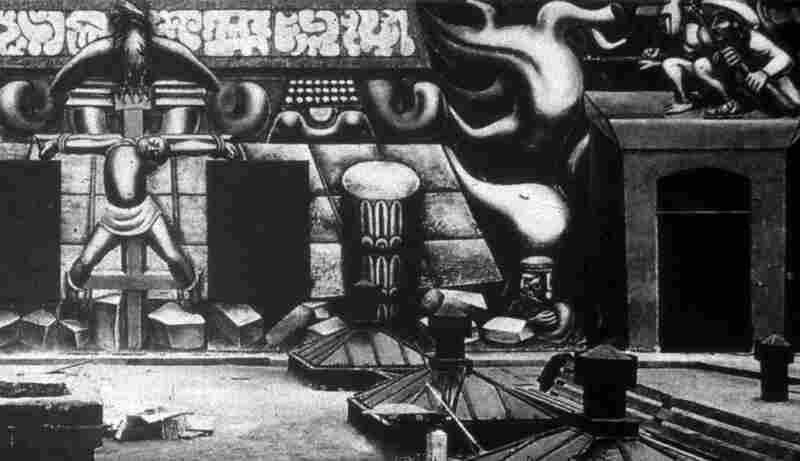 Siqueiros' mural was a response to all of that. The central figure is an indigenous Indian peasant lashed to a double cross. Bearing down over him is the American eagle, which two Latin American warriors take aim at from the corner. Siqueiros titled the mural America Tropical: Oprimida y Destrozada por los Imperialismos -- or "Tropical America: Oppressed and Destroyed by Imperialism." The Autry Museum's Siqueiros in Los Angeles exhibit follows the painting of and reaction to 1932's America Tropical. Enlarge to view the original work in its entirety. "It was political commentary, pure and simple, on an 18-by-82-foot wall," curator Luis Garza says. "He had the cojones to do it on that size of a wall, facing city hall. 'The chutzpah of this man; how dare he!' was the reaction by some." The mural scandalized Olvera Street officials, who ordered it whitewashed. "Without a doubt," Siqueiros says in the documentary, "my work was destroyed because of its theme." Ironically, years of being covered over by white paint actually saved the mural from complete deterioration by the sun and rain. Since the 1970s, Chicano artists inspired by Siqueiros' work have crusaded to preserve America Tropical. They finally got mainstream acceptance and help from Mayor Antonio Villaraigosa (L.A.'s first Mexican-American mayor in more than a century) and the prestigious Getty Conservation Institute. In September, city officials broke ground on a restoration project for the mural, which will include a platform on Olvera Street for people to view and appreciate Siqueiros work. America Tropical won't re-emerge until 2012, but Siqueiros' art is now on display at the Museum of Latin American Art in Long Beach and through January at the Autry Museum's exhibit Siqueiros in Los Angeles: Censorship Defied. The mural itself is still pretty faint, but photographer Jose Luis Sedano of Amigos de Siqueiros, the organization that will soon serve as stewards for the upcoming Siqueiros Mural Center, says the plan is to digitally project the original image over the mural. "There's still enough that it makes sense to bring it back to the people," Sedano says. "It's still a powerful statement."